In our last post, we had a good old moan about all things foul about the month of February, and with a degree of justification, I feel. Although I blame London for my coughs and snuffles, we did have a.... (I pause here, as I am not suite sure how best to describe our trip to the UK!)…. a lovely (and we mean really lovely) time, catching up with friends and family for the most part. Scotland and Yorkshire were particularly beautiful, as hard frosts had rendered everything white and Narnia-like, and we were looked after royally. Apart from seeing our friends in London, the City held very few charms. The weather was exactly as you’d expect: grey, constantly drizzly and miserable. The pavements had that slithery covering of dirty footprints, passing traffic threw up insults of brown spray and the faces of the general population bore the usual surly demeanour. We couldn’t wait to leave the physical claustrophobia of the city behind. I visited my Mum in a step-up care facility in Kent, one of the primary reasons behind this visit, and found it so distressing that it took me several days to get over the unexpectedly huge emotional impact of the trip. It was, in many ways, a difficult week. So….let’s put all that behind us and focus on food! We feel that we have now built up a bit of knowledge when it comes to good food here in Spain, and find it slightly galling when we hear friends and acquaintances deriding Spanish cuisine. We are not going to be talking about Michelin-starred cuisine here, although Spain is one of the major culinary stars in the foody universe; no, we are talking about good, traditional Spanish food that you can get free whenever you order a drink in a bar…..Tapas. Much is written about tapas, and in London (for example) there are high-end restaurants and would-be traditional bars that now serve all manner of tapas, and variations thereof. Andalucia is one of the few remaining regions in Spain in which most bars will serve you free food whenever you order a drink. The quality of this food varies with each establishment, and as with much in life, there are caveats. Not every bar will serve you free tapas. Some bars have a tapas menu with the price clearly stated. Some bars may purport to serve free tapas, but very occasionally, the owner may just not be in the mood! (Very rare and we have only experienced this once). Some tapas may consist of a few slices of jamon and a handful of picos (small, crunchy breadsticks), but then it’s free so no me puedo quejar. Below, we have listed some of our favourite tapas bars in Granada. In a future post, we will give a quick guide to some of our favourites in and around the valley where we live. This is not intended to be a definitive list, but these have always provided us with the best experiences! On the corner of Calle Elvira and Calle Almireceros, very close to Plaza Nueva. As with many of the larger establishments in Granada, Bodega Castaneda is divided into two: one half is the restaurant, with tables laid inside and out, and if you go here you will be handed a menu and expected to sit down for a full meal; the other side is the bar, and it is quite different. Go, just for the experience and the food. Do not be put off by the crowds, as this bar is often very busy particularly at lunchtime (from 2pm) and in the evenings from 9pm. Fight your way to the bar or stand beside one of the large wine barrels and you will soon be served. The staff in this place are amazing. There is a lot of hullabaloo, but this is a well-oiled and hugely professional outfit. We remember our first visit, standing (in a rather timid manner to begin with) by a wine barrel, and drinking our way through a bottle of lovely white Rioja, followed by two more glasses, as we tucked into the most delicious tapas, and the bill came to something ridiculous like €23. Order your first drink, and you will hear the waiter yell “Primero” and in the kitchen, the chefs will dish up the first in the list of free tapas. Arms fly, waiters whizz, drinks appear followed by food. The patrons are allowed to get on with the very important business of chatting, drinking and eating, supported by a theatre of staff ensuring that nothing gets missed. Bodega Castaneda is a celebration of Granada food and wine not to be missed. Sounds corny, but it’s true. Plaza Pescaderia, almost in the shadow of Granada Cathedral. From the outside, this is an unassuming place. We initially discovered it one evening, on our first visit to Granada, and it was an accidental discovery, but the vibe, service and food indicated that it was worth a repeat visit. At lunchtime, the outside tables are the place to be, as they are in full sun and the stools at tables provide a great spot for people-watching. Oliver, like Castañeda above, is a place of two parts, and inside the more formal restaurant is at the back, clearly marked. We just go for the tapas, the ambience and the service. The waiters are dressed in white tunics, and move about with professional ease, and the service is fantastic, delivering delicious tapas and drinks. The evenings are very busy, and it tends not to open much before 9pm in winter, but still worth a trip. Placeta del Agua, on the lower edges of the Realejo district. Blink, and you’d miss this place. More than one person recommended this small bar to us, and initially every time we went, it was closed! I think we just hit it at the wrong times! When it is open, it gets busy, particularly in the evening, and we have not yet managed to get in at night. We did manage to have a lovely lunchtime drink here though, and will certainly return. The bar is small, but it is full of genuine character. The staff are, as with all our recommendations, lovely. It is so easy to have one or two drinks, accompanied by scrumptious small plates of food, and just realise that the world really is not a bad place at all. We had never really considered this place, as we thought that anywhere so central would have inflated prices and be geared towards tourists. Not a bit of it. I think we ventured in having been to watch a march in aid of women’s rights, and the weather had turned foul so we searched out the nearest bar. Inside, the decor is a rather glamorous mix of gilt mirror and chandelier with a long bar and dining tables running along the two glazed external walls. This is a smart-ish place in which to enjoy a glass of cava or Montilla-Moriles. They advertise oysters, and these do seem popular, but as oysters make both Andrew and I want to heave, these are left well alone by us, but don't let us stop you! We fell upon this place one day when Restaurante Oliver was just too busy, and we couldn’t face loitering around waiting for an outside table to become available. What a pleasant little surprise it was. It is not going to win any culinary awards, but the tables and chairs outside afford a great outlook onto the Plaza Romanilla and all the activity that goes on there. Trees provide shade from the sun, and it is certainly a little more peaceful than some of the busier squares in the city. 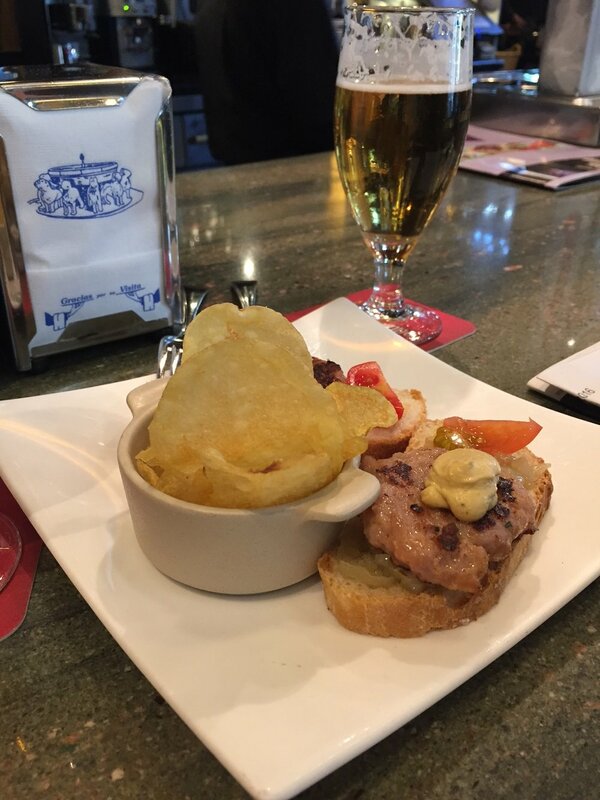 The tapas is good, and substantial, our favourites being mini-handmade hamburgers served with an onion marmalade - very tasty lunchtime snacks to help the beers go down. Last, but by no means least, we must mention our favourite sherry bar! This has the air of a very traditional bar, with dining tables at the back with windows that look up to the Alhambra across the Rio Darro. Our suggestion here is to sit at the bar as you enter, order a couple of glasses of chilled Manzanilla, tuck into a simple plate of jamon and just start the evening as you mean to go on, After two glasses of their delicious manzanilla, you will feel able to face absolutely anything. The first time we visited this establishment, we then went on to fill our boots in Bodega Castañeda, fall into a gin bar and then go onto a club and I don’t think we got back to our hotel until 4am. You have been warned.